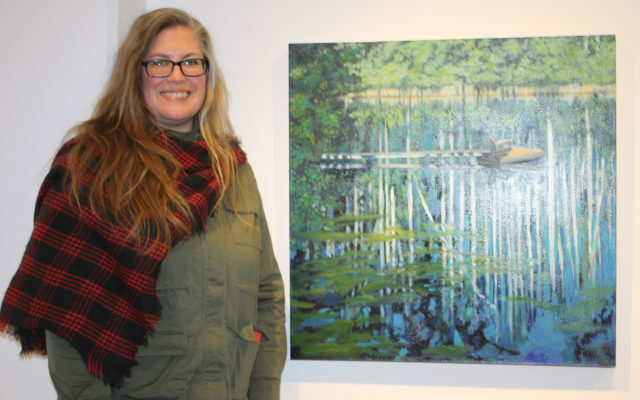 An artist who is in the process of moving to Aroostook County recently opened an exhibit at the University of Maine at Presque Isle that shows her affection for her new home through landscape paintings of various times and seasons. PRESQUE ISLE, Maine — An artist who is in the process of moving to Aroostook County recently opened an exhibit at the University of Maine at Presque Isle that shows her affection for her new home through landscape paintings of various times and seasons. Michelle Mishaan, who is originally from New York, has been an adjunct art instructor at UMPI for the past three years, commuting from her current residence in the town of Madison three and a half hours away. She is moving to Caribou in order to be closer to the university and has opened “Painted Landscapes of Aroostook County,” at the Reed Fine Art Gallery, located on the second floor of UMPI’s Center for Innovative Learning. The exhibit features 30 oil paintings that Mishaan based mostly on photographs she has taken during her travels from Houlton to Madawaska over the past 15 years. Much of the paintings convey winter scenes because she produced the paintings over a period of two months in early 2019 to prepare for the exhibit after the artist originally scheduled to appear in the gallery at this time dropped out. “I set a goal for myself of doing 30 paintings in 30 days. I wanted to capture the changing light in Aroostook County, even in the winter,” Mishaan said. Many of Mishaan’s paintings, such as the “Field Study” series, “First Snow” and “Sunset over Madawaska,” all set in the St. John Valley town of Madawaska, depict one of her favorite regions of Aroostook during various winters while several paintings near her home in Caribou show the piles of snow that formed high walls on either side of the road this past winter. In one painting, titled “O’ Pond: How my mind ponders thee,” reveals a lone wooden chair sitting at the end of a long dock in the middle of a pond during summer, with the shadows of trees reflecting atop the water’s surface. Mishaan said she was inspired by a “secret location” that she refers to as “Maine’s hidden gem.” Other works that she is fond of include a painting of a sunset moving across Route 1 between Presque Isle and Houlton and a large brightly-colored sky painting of the paper mill in Madawaska. Mishaan noted that the ever-changing light and sky colors and wide, open spaces are some of the reasons why the Aroostook County landscapes have captured her attention in recent years. With spring arriving, Mishaan plans to focus on a new body of work that portrays Aroostook County during the area’s warmer months. She looks forward to being settled in Caribou and having more time to explore what the various regions of northern Maine have to offer. “I think the solitude and the changing seasons provide daily inspiration for artists. There’s a lot of community support for people who have creative souls,” Mishaan said. “Painted Landscapes of Aroostook County” opened in the Reed Fine Art Gallery on April 1 and will be on display until Friday, May 10. The Reed Gallery is open Monday through Thursday from 7:30 a.m. to 10 p.m., Friday from 7:30 a.m. to 4:30 p.m. and Sunday from 2 to 10 p.m. The exhibit will also be open for public viewing during the next First Friday Downtown Art Walk on May 3 from 5 to 7 p.m.
• Michelle Mishaan’s painting “Caribou House After Snow Storm” depicts the area near her new home in Caribou after a major snowstorm hit Aroostook County in February 2019. • Michelle Mishaan’s painting “O’ Pond: How my mind ponders thee” (left) portrays a secret location in Maine that is one of the artist’s favorite places while “Shady Grove” depicts an area near Van Buren in the summer months. • These two paintings in Michelle Mishaan’s exhibit, “Painted Landscapes of Aroostook County,” portray harvested farm fields (right) and a sunset in the St. John Valley town of Madawaska. • Much of Michelle Mishaan’s new exhibit at UMPI’s Reed Gallery focuses on areas in Madawaska, such as the paper mill (right), farmers’ fields and the vast open skies. • The painting “Farmer’s Field” portrays one of Michelle Mishaan’s favorite fields in the town of Madawaska as the snow melts in spring. • In her UMPI Reed Gallery exhibit, Michelle Mishaan displays 30 oil landscape paintings of Aroostook County including ‘New Sweden Brook” (right) and “Aroostook Sky II” which depicts a scene in Madawaska. • Michelle Mishaan’s oil paintings on display at UMPI’s Reed Fine Art Gallery depict many forms of landscapes in Aroostook County, including a sunset in Central Aroostook (right) and harvested potato fields in Madawaska (second from left).